It was a no-brainer given geography, history and budgets for both teams. With the dissolution of the four-team College Hockey America League, effective the end of last season, the Bemidji State Beavers in Minnesota were quickly granted admission by the Western Collegiate Hockey Association as that league's 11th team. Shortly after Bemidji's move, the CCHA's Nebraska-Omaha Mavericks petitioned the WCHA for a transfer to become the 12th team. A combination of major factors brought the CHA demise: Findlay and Wayne State had dropped men's hockey; significant travel costs and loss of class time for Bemidji State (Minnesota), Niagara University (upstate New York), Robert Morris University (Pennsylvania), and Alabama-Huntsville; the undercurrent of dissatisfaction across the other leagues that one team in a four-team league automatically qualifies for the 16-team NCAA tournament by winning the two-day CHA tournament. Thanks to one of college hockey's all-time acts of philanthropy, Penn State is launching men's and women's ice hockey. An 88-million gift from alumnus Terry Pegula and his wife Kim last month, launches the program and project that includes a new on-campus arena with a capacity of 5,000-6,000. Pegula is the founder and former CEO of East Resources, Inc., a natural gas exploration and development company. In July, he sold the company to Royal Dutch Shell for a reported $4.7 billion. He said being involved in his sons' youth hockey experiences and seeing how it helped shape them was instrumental in the decision to donate the money. Penn State, recognized for its football program and recently admitted to the Big-10 conference in that sport, is a natural lock to become the CCHA's 12th hockey team unless the formal establishment of a Big-10 hockey league inches forward. Powerhouse programs like Michigan, Michigan State and Notre Dame are already in the CCHA. The last time such a dynamic took place was in the mid-80's when several ECAC teams spun off to create Hockey East. Consensus is that Penn State will begin play in the 2012-13 season. Current NCAA rules require that a team play an independent schedule in Division I for one season before being admitted to a formal conference. "We are excited to hear that Penn State has decided to launch Division I men's and women's hockey and will be making such a substantial commitment to the sport," CCHA commissioner Tom Anastos said. "The CCHA and our entire membership welcome them to the college hockey family and look forward to supporting their transition into Division I hockey over the next several years. "The CCHA's formation 40 years ago was based on the development of emerging programs and, as we set our sights on our next 40 years, we look forward to working with programs such as Penn State and hopefully others, in providing leadership that will increase the profile of college hockey and foster continued growth." 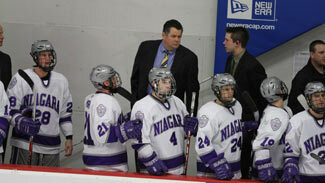 Niagara and Robert Morris were admitted to Atlantic Hockey to create a new 12-team alignment there. Alabama-Huntsville plays an independent schedule this season. "No question, both programs make us better," WCHA commissioner Bruce McLeod said. "The addition of Bemidji State and Nebraska-Omaha not only make us better, they also make us tougher. Bemidji is hockey country. Their entry into the WCHA and their new building are both generating a tremendous amount of enthusiasm. "Nebraska-Omaha lies in a great metropolitan area that brings new interest to the WCHA. They are a newly-energized program and are committed to a quality program as evidenced by their hiring of Dean Blais and the future addition of a new on-campus facility that will seat nearly 8,000 fans." Blais is no stranger to the college game. Before taking over at Nebraska last year, he served as assistant coach with the Columbus Blue Jackets. From 1994-2004, he coached the North Dakota Fighting Sioux to five trips to the Frozen Four, including two scintillating come-from-behind wins for national championships in 1997 over BU and 2000 over BC. His charges posted a 20-16-6 record last year in CCHA play. They are off to a stellar start at 4-0 with back-to-back wins last weekend over Blais' alma mater, Minnesota, all good for a top-10 rank this week. "We can pretty much bus everywhere between five and eight hours," Blais told NHL.com about the move. "Last year, we ended up flying for half of our series. Also, our fans are going to be able to get to more places easily and see us play. "I think when you look at the top 10 teams in the country every year, there could be up to five WCHA teams, so we know that we're entering the toughest, most elite conference in the country. The players know that being in that league means that we've got to be committed to excellence." The new season also brings emerging rivalries. "Certainly Mankato, [also] being the Mavericks," Blais said, "because we've played them so much over the years and being only four hours up the road. I think also North Dakota because of my ties. Whether we're in that category and can compete with them on a year-to-year basis, we'll see. I really think down the road it will be Colorado College and Denver just because of the location -- being west. We're basically a straight shot down the interstate." Ten-year Bemidji coach Tom Serratore's Beavers are a variety of interstate routes from the four other Minnesota-based teams, all in the WCHA. Serratore's track record of five CHA titles, three league tournament titles, and four NCAA appearances, including the league's only Frozen Four entry in 2009, add up to a smooth transition to the historic league. The Beavers are winless at 0-2 to begin the new season. Last weekend they opened their new arena -- the Bemidji Regional Event Center. What's best about the move to the WCHA according to Serratore? "The exposure we will get nationally as well as in our own state of Minnesota," he said. "I think North Dakota and all the Minnesota schools will be rivals because of proximity. We already have established rivalries with Minnesota State and Minnesota-Duluth because we have played them twice every year since 1999." How will his Beavers react to their new league? "I really can't tell early on because we have went about our business the same as we always have," he said. "The players do understand having to play a WCHA schedule for 28 games will be challenging. The thing about the WCHA is that you can play very good and lose. We have played quite a few WCHA games and the mistakes you make in those games are more magnified because of the high-end talent and depth of the WCHA teams." The WCHA has won an NCAA-best 36 national titles since 1948. Bemidji and Nebraska now aspire to add to that total. New WCHA "Final Five" Tournament format: The WCHA's historic "Final Five" will live on in name, but with the admission of Bemidji State and Nebraska-Omaha, the tournament will now become a six-team event. All 12 teams will take part in the postseason with six first-round series played on campus sites. The six series winners will advance to the Final Five in St. Paul at the Xcel Energy Center, with the top two remaining seeds getting a bye into Friday's semifinals. The 3 through 6 seeds will play in Thursday games to pare the field to four for the weekend. The third-place game will be eliminated. Former UMass-Lowell great passes away: Greg Charron died Monday night after a courageous battle with stomach cancer at the age of 42. "UMass Lowell has lost a great friend and former student-athlete," UMass Lowell Athletic Director Dana Skinner said. "Craig was a hero on the ice and in every community in which he played or lived. He was such an inspiration to so many throughout his young life. His passing will be mourned by all who knew him. We share our deepest sympathies with his wife, Wendy, and their four courageous children." Charron was a standout forward for the University of Lowell from 1986-90, serving as captain during his senior year. Upon his graduation, Charron was the second-leading scorer in the program's Division I history with 148 points on 64 goals and 84 assists in 142 career games. His accomplishments in a Chiefs' sweater still stand the test of time as he ranks 13th among all scorers in school history. During his sophomore season, ULowell appeared in its first ever Division I NCAA Tournament in 1988. On Campus Clips: Robert Morris is off to a nation's best 4-0 start, matching Nebraska-Omaha's same slate. Led by a 3-1-4 scoring line from senior forward Carter Camper, the RedHawks beat and tied St. Cloud State on the road in a series featuring the nation's top two career scorers. Camper now has 135 career points while the Huskies' Garrett Roe was held to one assist and has 145 career points. … Jeff Jackson recorded his 300th career win as a Division I head coach with Notre Dame's 4-2 victory over Lake Superior State last Thursday. From 1990-96, Jackson won 182 games for the Lakers and since 2005 has added 119 more behind the Irish bench for a career mark of 301-118-47. … The six Ivy teams -- Cornell, Harvard, Dartmouth, Brown, Yale and Princeton -- begin play the last weekend of October. Ivy schools prohibit playing until the weekend entering November.